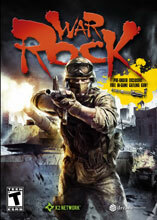 WarRock is a free online FPS game developed by a Korean company that offers you the opportunity to experience online battlefields on a large scale and support vechicles for land, sea and air (Battlefield 2 style). You need to visit the official homepage to register in order to play. It features graphics and effects that are of a quality you would expect from a very good commercial project. The gameplay is similar to Battlefield and features spawning and frantic online fights. Three generations have passed since a secret war occurred at the brink of the continent. The tides of darkness swept over the world. Players must rise against it and experience the adventure of a real battle. There's a messenger system that provides powerful support to the game community. This system will become more powerful through the 'Trading System' between players. Various modes such as conquest and death match are available. Each time players respond, they also get to choose from five character classes: engineer, medic, patrol, assault and antitank. Each character has distinctive weapons and abilities. Players can buy their own weapon through battle points or game money, depending on level.